The weather this year is driving my crazy! At this point I just knew I'd have my seeds in the ground and planning for weekly weeding...NOT! Since I'm getting antsy I decided to start some seeds indoors. This will give me a little head start and also help me with succession planting. Succession planting means planting at different times so that you can harvest throughout the season instead of harvesting once. 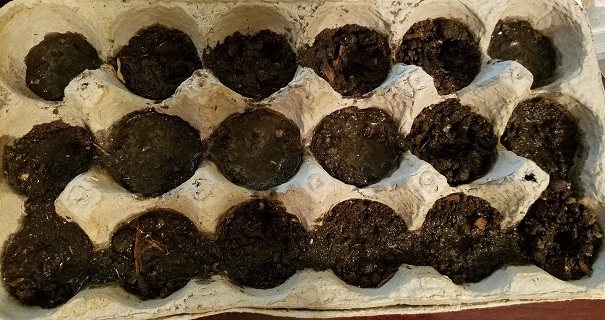 So, I grab a paper egg carton that I had on hand and put dirt in it that I brought inside a few weeks ago from my compost pile to warm up. After I did that, I realized in my haste, there were a few things I should have done before that, but what the heck, I'm already in at this point. I'll make a chronological list for you all at the end to make it easy to follow. Getting back on track, I put the dirt in the carton and then I realized that I needed a drainage hole. I used my hanger tool (the top part of a broken hanger) to poke a hole in each egg crate. Once that was done, I took a water bottle and put just enough water to cover the top of each crate and waited for it to seep into the dirt. On the side of the egg carton I write the date that I plant the seeds. This helps me to keep track of how long it takes to germinate and grow into a full plant and produce. I decided to plant a few things. My egg carton had 18 sections, so I decided on 6 different seeds and planted three sets of each. On each row I wrote what I planted so I wouldn't have to guess later. Next I dropped 1-2 seeds in each crate. Once the seeds were in, I lightly covered them by creating a hole with my hanger "tool" and then softly pushing the dirt over the seed. Since this is in the house and humidity is low, the soil can dry out rather quickly. I went to grab some saran wrap, but since this was an impromptu planting I had none. No worries here since I need to check on the seeds daily for the first week or two to watch for germination. I moved my completed seed starting egg carton into my dining room which doesn't drop below 65 and gets wonderful light throughout day. Now I wait, watch and pray! Make a hole in your egg carton crates. I prefer paper or Styrofoam because it easy to make holes. With paper cartons I make a single hole. When using Styrofoam, I would put 3-5 small holes with sharp pencil or pen. Write on the egg carton the date you are planting the seeds and what seeds you are planting. You can also put the seed packet on the edge of tray to identify them. Mix your dirt/seed starting mix in the bowl with water in a bowl. It should be moist so it is slightly sticky but still a little crumbly. Check your seeds daily. If the soil looks light then it is drying out and you need to water . If you are using a Styrofoam egg carton then you can pour water in the top and water from the bottom. In 25-30 minutes you should see the soil darken up as it absorbs water. If you are using a paper egg carton, then you want to use a spray bottle to water so that you don't disturb the seed and soil from the force of the water. Also make sure to turn the crate daily to ensure even distribution of light.